We are a leading Manufacturer of dc circuit network theorem, mosfet characteristic, schering bridge, amplifier trainer kit, diode limiters trainer kit and zener regulated power supplies trainer kit from Jaipur, India. With our rich industry experience, we are engaged in offering DC Circuit Network Theorem. Effective to use and simple to connect, the offered product range is designed using high quality factor inputs and the innovative technology. The offered product range is widely demanded for its performance & quality. Our offered product range is provided in several specifications to meet all requirements of our customers. Additionally, the offered product range can be availed by our customers at competitive rates. 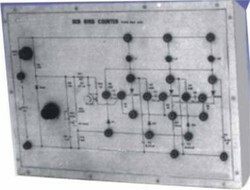 Experimental Training Board has been designed specifically to study the various types of Passive Filters and to determine the different constants as well as cut-off frequency of that particular passive filter. Practical experience on these boards.rries great educative value for Science and Engineering Students. We are the leading manufacturer, trader, and supplier of an exclusively designed Schering Bridge. Has Regulated Power Supply internally connected, our offered Schering Bridge is designed using excellent quality components under the direction of experts. This Schering Bridge is also checked on several quality parameters to assure its flawlessness. Owing to their outstanding quality & performance, our offered Schering Bridge has potentiometer for balancing the bridge. Experimental Training Board has been specifically designed for the study of Class B Transistor Amplifier Trainer Kit .Practical experience on these boards carries great educative value for Science and Engineering Students. To plot the frequency response characteristics. To draw the transmission characteristics of the different Diode Limiter configurations. 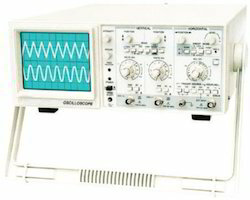 To observe the limiting action of the sine wave on the Oscilloscope. To observe the effect of diode capacitance at very high frequencies. VE-2576 Trainer Kit has been designed specifically for the study of regulated power supplies based on Zener Voltage regulating diodes. A Zener diode is generally employed in a standard circuit as a voltage regulator. This training board deals with some more possible voltageregulating circuits apart from the standard one. The board is absolutely self contained and requires no other apparatus. To study the standard zener diode voltage regulated power supply. To study the zener diode voltage regulated supply having two zener diodes in series. To study a dual polarity voltage regulated supply employing two zener diodes. To study a zener diode voltage regulated supply employing a series pass transistor for increasing the output current capability of thecircuit. Power Electronic Training Board has been designed specifically for the study of Electrical Characteristics of Uni- Junction Transistor. 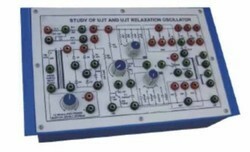 The UJTs are widely used for Relaxation Oscillator, waveform & pulse generators and firing circuits of SCR's and TRIAC’s. This Training Board can alsomake use for designing firing circuits and control circuits for thyristors. 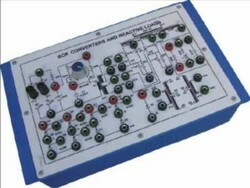 Power Electronic Training Board has been designed specifically to study the SCR conduction in different circuit configurations and under various forms of load. The load can be selected from resistive, inductive, capacitive or combinations of any of them. The SCR converter can also be used as source for other experiments. 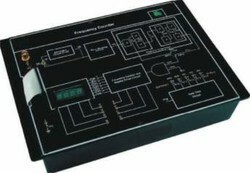 Power Electronic Training Board has been designed specifically to study three stage SCR Ring Counter which can be extended to any number of stages by adding identical circuitry, if required. This board demonstrates high power load switching in a sequential order. This set-up can also be used as sequential flash over. The time delay between each sequence is adjustable. This training board facilitates students to understand UJT triggering circuit for SCRs and communication circuit for turning them off in sequential operations. 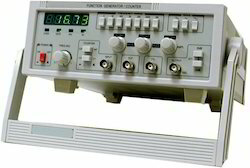 Frequency Counter Trainer, is an exclusive and attractively designed product to demonstrate the fundamental principle andfunctioning of Frequency Counter. It includes various circuits namely, attenuator circuit, wave shaping circuit, frequencydivider circuit, display driver circuit, and gate time circuit. 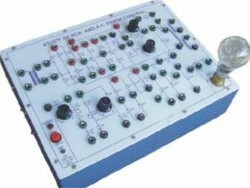 All these circuits are incorporated on a single board for study and verification. Simple representation of all the circuits can explain corresponding functionality in a very easy way to perceive the logics. Today’s electronic gadgets & equipments are miniaturized with each passing day. In the industry it has largely replaced the previous constructionmethod of fitting components with wire leads into holes in the circuit board (also called through-hole technology) and it has totally revolutionized the manufacturing process. Surface Mount Technology (SMT) is method for constructing electronic circuits in which the components are mounted directly onto the surface of printed circuit boards (PCBs). Electronics devices so made are called Surface Mount Devices or MSDs. An SMD component is usually smaller then its leaded counterpart because it has no leads or smaller leads. It may have short pins or leads of various styles, flat contacts, a matrix of balls (BGAs), or terminations on the body of the component (passives), unlike discrete components, SMD components have a huge vareity of packages (size). SMD Technology will be the order of the day for the electronics industry in the coming years. SMD offers Small size, consequent High Packing Density, High Reliability & Improved High Frequency performance. SMD Technology Kit to keep you in pace with the technology revolution. The user is familiarized from components their packages to soldering practice. 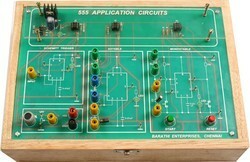 Power Electronic Training Board has been designed specifically for the study of Electronic Timer using IC-555. The board is absolutely self contained and requires no other apparatus. Leveraging the high industry experience, we are engaged in providing a wide assortment of Operational Amplifier Trainer. 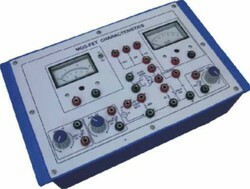 Used in mechanical, electrical and many more application areas, the offered amplifier trainer is given in various specifications to choose from. 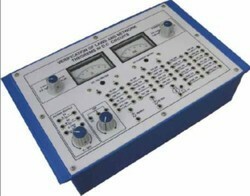 This amplifier trainer is designed using innovative technology in comply with the international quality standards. The offered amplifier trainer is given in several customized specifications according to the various needs of our customers. 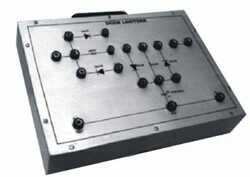 Power Electronic Training Board has been designed specifically to study the use of SCR and TRIAC in D.C. and A.C. lamp flasher respecively. 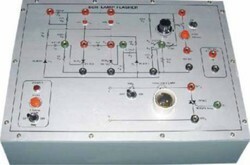 The flasher is useful for students of understand the application of SCRs in D.C. flasher, triggered by UJT relaxation oscillator. The repetition rate of the flasher can be varied by varying the frequency of the relaxation oscillator. This Training Board also makes use of the same SCR D.C. flasher for making the TRIAC ON and OFF in the A.C. power circuit which operates a normal 230V incandescent lamp used as load.